Toure, 30, has 22 goals this season, helping City to win the League Cup and challenge for the Premier League title. Samir Nasri recently said Toure would be celebrated as one of the world's best midfielders were he not African. In an interview for Football Focus on BBC World News, he said: "I think what Samir was saying was definitely true." The midfielder has won league titles in four countries - Ivory Coast, Greece, Spain and England - and was part of the Barcelona team that won the Champions League in 2009. He also feels fellow countryman Didier Drogba and Cameroon's Samuel Eto'o are undervalued because they are African. "To be honest, proper recognition has only come from the fans," said the three-time African player of the year, also voted BBC African footballer of the year in 2013. "I don't want to be hard and I don't want to be negative, but I want to be honest." 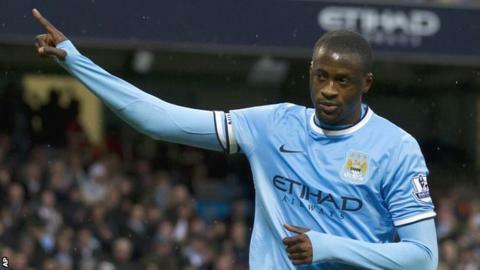 Toure feels the media should do more to promote African players. "If we play well and we don't have the recognition from the media, we are not going to be where we want to be," he said. Toure also feels African players need to do far more to stand out, drawing comparisons with Barcelona duo Andres Iniesta and Xavi, both former team-mates of his. He says Iniesta and Xavi are often praised for their attacking skills, but rarely singled out for criticism when they fail to defend properly. In contrast, Toure claims he is regularly picked on by the media when he makes a defensive mistake. The Ivorian is also unhappy that Lionel Messi, widely regarded as one of the best players in the world along with Cristiano Ronaldo, is recognised around the world but players like himself are not. He said: "If you go to any part of Africa now, people will say, 'yes, we know him [Messi]', but when you come to Europe and say 'Yaya Toure' people will say, 'who is that?' Some will say they know my name but not know my face. But they will know Messi's face." Toure, who played in Belgium, Ukraine, Greece, France and Spain before moving to England, says he will be disappointed if he is not named player of the year by the Professional Footballers' Association. He is one of six players on the shortlist, alongside Chelsea's Eden Hazard, Southampton's Adam Lallana and the Liverpool trio of Luis Suarez, Steven Gerrard and Daniel Sturridge. Asked if he would be unhappy not to win the award, Toure replied: "Definitely. As a champion, as a winner, I always want to win." Asked to reflect on the fact there has only been one African winner of the Ballon d'Or - former AC Milan and Liberia striker George Weah in 1995 - Toure cited the significant contributions made by players such as fellow Africans Eto'o and Drogba at club level. "Those players are more than legends for me and Africa," said Toure. Asked if he knew if players such as Eto'o and Drogba also felt under-appreciated, the former Barcelona player replied: "Definitely." He added: "I am very proud to be African, I want to defend African people and I want to show to the world that African players can be as good as the Europeans and South Americans."